This last two days I've been on a go. 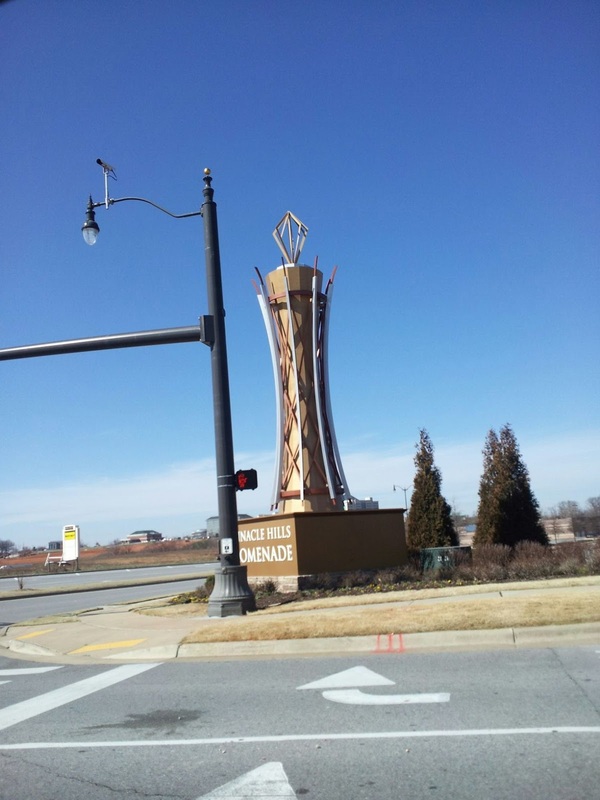 My first road trip was to a small town Rogers in North-West Arkansas. The road took me through the breathtaking view of the Boston Mountains. Day was calm and sunny, but land was ready to burst in a full bloom. Stirring the wheel, I remembered driving visitors around Seattle area and listening to their admiration and comments about Lake Washington and the gorgeous view of Olympic mountains ahead and Mt. 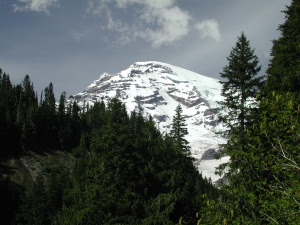 Rainier on the left. I realized that when we lived there, we took surroundings for a granted: view was everywhere you look. As much as I try to find positive and beautiful things here in Arkansas, I have to admit, I miss Seattle to the ache in my chest. I would kiss every single drop of the rain when I go back (in 16 months, after my husband is done with his residency program. Actually, it's 493 days). And even though Rogers is following Bellevue on the list of 100 best places to live in the US, I would still choose the rainiest part on the world. Well, enough of nostalgia. And back on the road. 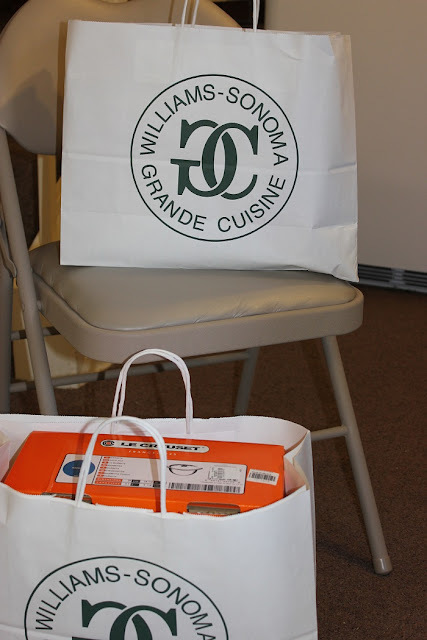 The reason of my trip to Rogers was to visit Williams Sonoma store. Best store ever, I love just to go there! I've collected a few gift cards to Williams Sonoma store through the year, and I decided to turn it into another Le Creuset pot. 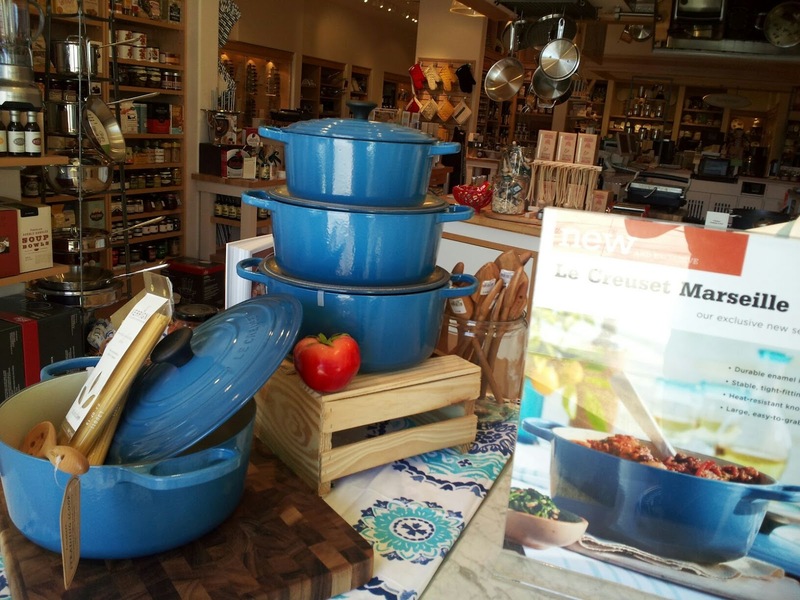 WS and Sur La Table often have an exclusive offer on Le Creuset at a very reasonable price. I've been on a watch for the special deal for one of my favorite pots for a few years, and my patience was paid off: I got 4.1l (a little over 4 qt) pot for $150 (in my gift cards), almost $100 in savings! I had some cards left so I treated myself with some other kitchen gadgets to help me with my nostalgia. I have to admit, I am really addicted to the iron, not only at the gym, but in the kitchen too. Who is the cast iron addict? I am! I could never have enough cast iron pots, skillets, dutch ovens, etc. Especially as cute as the Le Creuset! Do you have any kitchen addiction? Do you believe in shopping therapy? Good choice Marina we love your new Le Creuset pot! Thank you. I need to cook something in it! It's ok Rasi, I am powered by optimism, so I don't get into depression very easy. I have just one life, so I enjoy moments, and there's plenty of those no matter where I live. Thank you for your support! 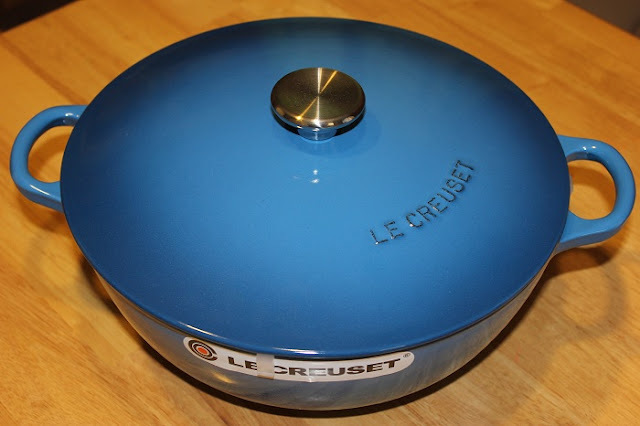 I also have a blue Le Crouset, fantastic, and the stamp for biscuits.. in Japanese! It sounds like a great road trip, enjoy your shopping now! Thank you Alessandra! Baking is an order now to test those cookie cutters! So cool! I got the message in a cookie cutter when I was planning our wedding, and we made them for the rehearsal dinner -- so cute! And I am jealous of your Le Creuset!! I don't have red one (yet?!). Thank you Suchi! 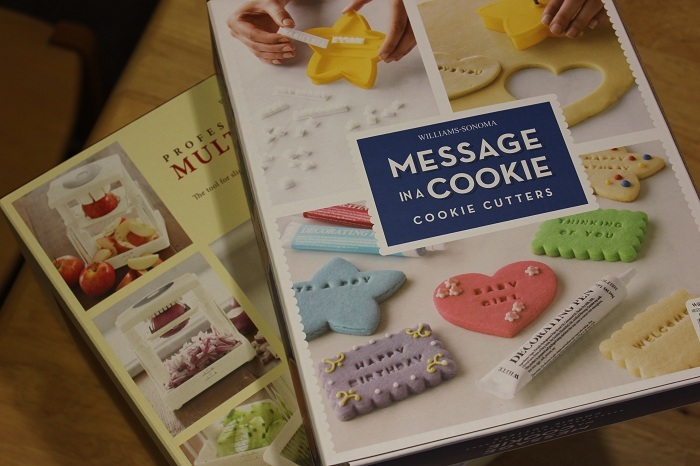 I thought that those cookie cutters are cute too, I love to personalize cookies for an occasion. We have a few birthdays coming up, so I will put it to work soon! Yes, Diane, this store (and Sur La Table) are two that I just can go in and look around without buying anything , and it gives me some ideas, inspires me with a new kitchen projects, etc. I don't even have to by anything! Look at me: I've collected those gift cards for more that a year before I spent it! Two years ago I visited Seattle for a day and thought it was wonderful. Visited the markets on the waterfront, ate at a little restaurant beside the water. It was raining when I got there and raining when I left. Was riding my motorcycle. Very beautiful state. NICE cast iron pot. I used to make cornbread in an iron skillet. Had 5 sizes! My hands aren't as strong as they once were, so have switched to lighter cook wear. Thank you Sheila. I do have about 5 cast iron skillets, Lodge brand, and I love it! I bake my bread in it, use it all the time. They are heavy, yes. We even had to buy a non-stick crape pan for our son when he wanted to learn how to make crapes. Shopping is definitely therapeutic! Getting the credit card bill on the other hand, not so much! Stellina, Thank you for visiting my space! What is credit card bill?! Your post reminded me of a visit to Fort Lewis in Tacoma, near Seattle, years ago when I was in the Army. We borrowed an RV from a US Army friend and set off to explore. As you say, some lovely scenery there. Very different to our Cotswolds, eh? I loved your post on Cotswolds though.It is a beautiful place, and I hope to visit it some day. I've never been to Rogers actually. I love the views in Seattle though. Mt. Ranier is just gorgeous. Thank you Heather. Yes, Seattle, and whole Washington state has some beautiful places. Although, I drove yesterday to another place here, and the view was breathtaking. Come back to see pictures! I am with you on window shopping! What an interesting post. I have never been to Seattle or neither Washington. It looks very interesting to visit and to shop! Thanks for sharing this. Have a good weekend! Alida, yes, Seattle has a lot to offer, especially it's beauty. Have a good weekend too! I think shopping is the best therapy for nostalgia. I remember when I was studying in the US so far away from home, when I felt nostalgic and lonely I visited a shopping mall for shopping therapy lol. It costs you a little bit but it makes you feel better. I love cast iron and I want to buy a cast iron skillet once I find it in good price here. Thank you so much for your interest about my son. He is adjusting quite well at his new school. He says that children in his class are very kind and do not fight at all. Overall I think he is happier there! Take care and have a great weekend! I am so glad to hear that your son loves new school better. It's a relieve for him, and for you, I bet. My cast iron skillets a Lodge brand, they are black in color but cooking is a pleasure in it. I try not to think about it, but sometimes the wave of emotions just hits me, and I need some "therapy" to deal with it. Thank you for your support! WS sure is a great store. Love your message cookie cutter. Hoping one day to visit Washington State. Yes, they are expensive. That's why it is a treat when I am able to buy something there. Thanks for visiting me! I am a total Le Creuset addict too- just the best. of course they've discontinued the color I was working on so now I have to branch out. Congrats- great new pot! I have never been to Williams Sonoma. They aren't a staple in south Georgia. I collect Fiestaware and gadgets. Have a super weekend, new friend! Oh Yes, that lemongrass color in Fiestaware just puts a smile on my face each time I walk by it. Thanks you, have a good time too! love d cookie cutter & le cruset..! Thank you Lizzy. On contrary, my husband doesn't believe in shopping therapy. He doesn't believe in credit cards either. So, we live on whet we earn... How boring, ha?! Nice spending a few minutes visiting with you! I've been looking at this cookie cutter for over a year. When I got some money left on the gift card, I just decided it's time to get it. It is so nice to give someone a personalized cookie with a message. I am looking forward to have some fun with it! Thank you, Lorraine for visiting me! Beautiful pictures! We have an incredibly beautiful country from one end to the other, the middle too! And oh, what a fun shopping extravaganza - I LOVE WS, too! I'm just addicted to kitchen stores in general, could snoop around for hours and not get tired! I agree with you, it is beautiful! Or, Dear Anna! You are so right! shopping therapy, and window shopping therapy is so much-much cheaper! Catherine, that's exactly what I usually tell everyone about cast iron pots: it is part of my workout and a way of keeping my arms toned! :) Thank you! Sorry to hear about the store closing. I hate when it happens. Well, look at the bright side: there is always on-line store, and it's open 24/7, and you can shop in your pajamas, and you can just add to your basket anything you want (that's what I do) without clicking the "checkout" button. :) Fun! Dear Lindy, I am afraid even to start it: I am addicted to cookery books too (ask my husband what books I read every day!). Thanks for coming here today. Have a wonderful week! I have many, many kitchen addictions, not the least of which is cookbooks! Sounds like you had a great time. Can't wait to see what you make in your new Le Creuset!